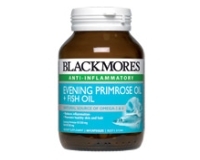 Blackmores Evening Primrose Oil + Fish Oil is a source of omega-3 and omega-6 essential fatty acids which are important for the structure and function of cell membranes. They are also essential for nerve function and growth. Essential fatty acids are important precursors of prostaglandins which reduce the inflammatory response. - Natural source of omega 3 and 6. - Important for reducing inflammation. - Important for structure and function of cell membranes. - Important for maintenance of general health and well being. - Important for skin and hair growth. Adults - Take 1 capsule 1 to 3 times a day with meals, or as professionally prescribed. Children 6-12 years - Take 1 capsule 1 to 2 times a day, or as professionally prescribed. Children 2-6 years - Take 1 capsule a day (pierce and squeeze into milk, juice or cereal). No added yeast, gluten, wheat, milk derivatives, preservatives, artificial colours, flavours or sweeteners.